Clixsense.com Review – How I Earn my First $25 from India? 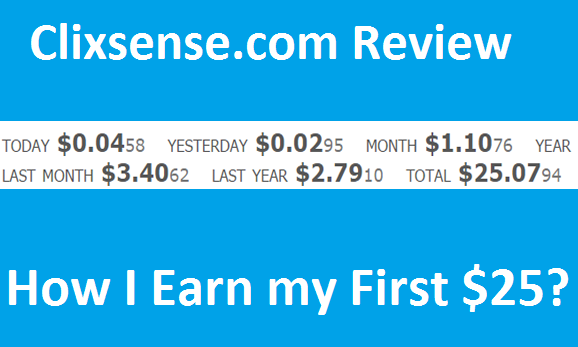 You are here: Home / Make money Online / Clixsense.com Review – How I Earn my First $25 from India? Clixsense is one of the best survey website that I ever seen. I am a regular guy who loves to work with Clixsense daily. Clixsense.com is an amazing way to make money online. Since I was successfully earned more than $25 so today I am going to talk about how I make money in Clixsense.com and what are strategy I have been using here to earn money. At the end of this article I have free eBook that cover a brief tutorial that most of the top survey earning always hide from you. So if you are new on Clixsense first get register from here and read continue to reveal. Why Clixsense.com is a top paid PTC Website? Why people get failed to earn money with Clixsense? Some people say Clixsense is not so good to earn from India! But it’s not likely true , I have made $25+ with my 3 month of effort and I have a Clixsense review on how much money does India can earn here? (if you not yet read it Read now) I guess the following reason may create a elution to believe that we India can’t earn money here in Clixsense. Recommend Read: Will clixsense premium account adopt efficiency route to double your earning? People don’t understand properly how Clixsense work. Lazy to share Clixsense referral link to friend and people around social networks. It’s a big mistake if you are not yet start your own blog to refer people on Clixsense and other affiant marketing. Do you know you can send up to 60,000 emails from amazon marketplace, why not use such free service to send email and let people know about how to make money with Clixsense? Facebook: I have lot of friend on Facebook, so used then to make money for me, In a week I share my Clixsense affiliate link and 10-15 people join through. Twitter: Do you tweet? If you have a 1000+ fan on twitter you can tweet about Clixsense and earn money by referring your twitter follower. This and old tricks that most of the twitter holder earn by doing tweet and earn jobs online. YouTube: Put some video tutorials on YouTube on how earn money by doing survey, view ads and play game on Clixsense. While you are editing your video let viewer know that you have posted a link in description that redirect to Clixsense.com. Don’t forget to meson your affiliate ID in order to earn commission. Google +: Do you know Google + is second best way to connect with people on social network. Why not share your Clixsense affiliate links and few Clixsense reviews article to earn more money. Email Marketing: Sign up for amazon market place and you can able to send 60,000 free without get into spam folder. This type of email marketing has 20%-35% of click rates, so send professional newsletter and earn a lot from your email id database. If don’t have email id database start a blog and use option form to grab 30-50 email address into your marketing list. Next to Read: My First $100 in Email reading jobs without investment ! Yahoo Question Answer: A lot of people asked question on yahoo and Quora Digest on how to make money online , simple be register their and let them know about Clixsense. This will surely generate a lot of reviews from 3-8 line opinions of yours. FREE EBook Download: Start a free blog and asked people to register on Clixsense and crate win-win situation by help then free eBook distribution. WhatsApp Group: I have seen a many of whatsapp group adding me automatically, why not share them your Clixsense affiliate link instead of blocking them. So which one of my trick does like to engage more money from Clixsense? Do you have any more suggestion and want to share some valuable tips that may be help our scamdesk.com reader? Let me know by commenting below. And if you are not yet joined in click here to join Clixsense now with my free eBooks. This information is useful to start a ptc job thank you mr.sriram. The tricks on your post to recruit referrals are usefull and helpfull for beginners. While every of the ways you mentioned are limited. At a certain point all of the practice turns to spam, you can ask once but always is spam. Its funny that I use to spam people on a smart way. Whenever anyone added me to any irelivent WhatsApp groups, I warnned the group members not to add me on such boring and irelivent groups. Whenever I got bad reply about ego problem or spam related, I use to spam every groups offen with attractive money making post like ‘earn money viewing ads, get paid via paypal’ with my affiliate link. Same with Facebook groups. I received many negative feedback about this process from other group members. But the good part is I received more than 50 referrals, maximum were inactive, but lots of signup bonous for me. I earned more than $20. I personally didn’t like the process, but it was a fun game for me on those days. On my point of view, Blog is the only good way to get referrals continuesly.